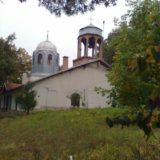 “A noble cause unites lecturers and students at the University of Transport in Sofia; following a tradition of many years they are raising funds to restore the chapel which existed on the institution grounds in the past”. 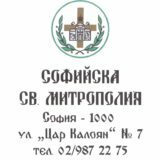 This is the way Goran Blagoev started introducing a coverage filmed with respect to All Bulgarian Saints Orthodox Church at Todor Kableshkov University of Transport, Sofia. Coverage authors were Livia Niklina and Plamen Gerasimov from Faith and Society TV programme on BNT-1. 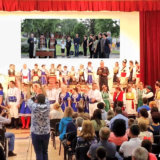 Sequences from carried out academic celebration on the occasion of fund-raising campaign launch were shown as well as interviews given by Transport University Rector prof. Daniela Todorova, assoc. 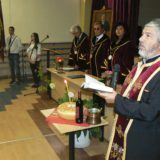 prof. Dimitar Dimitrov, lecturer at this institution and initiator of church construction idea, assoc. 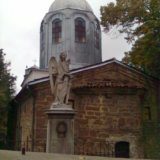 prof. Dimitar Dimitrov, lecturer with long years of service at Faculty of Theology, Sofia University and conductor of St. Alexander Nevsky patriarchal cathedral choir. Students and institution student council representatives, alumni, colleagues and friends supported the idea of church construction and shared their hope for church faster completion. 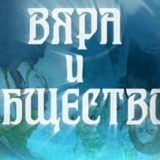 Goran Blagoev, the presenter, summoned volunteers to support All Bulgarian Saints Church under construction at the end of programme. 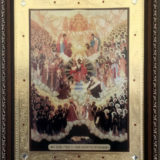 We benefit from the opportunity to publicly thank presenter Goran Blagoev, authors Livia Niklina and Plamen Gerasimov as well as the entire Faith and Society TV programme team for spreading the idea of building All Bulgarian Saints Orthodox Church on the grounds of Todor Kableshkov University of Transport.